Bring breakfast a blast of color with these Patriotic Fruit and Yogurt Parfaits. Made with fresh fruit, yogurt, and a sprinkle of granola, these patriotic parfaits are perfect for breakfast or a midday snack! What’s better is that there is no recipe needed for these bad boys! Start by placing blueberries in the bottom of the parfait glass. This is for no other reason than blueberries are easier to spoon out of the bottom of a parfait bowl than yogurt. Then simply layer yogurt, berries, and granola. Add a few fresh berries to the top for decoration. Then watch as your family happily peers into the glass of goodness! Don’t have parfait glasses or the time to sit down for breakfast? 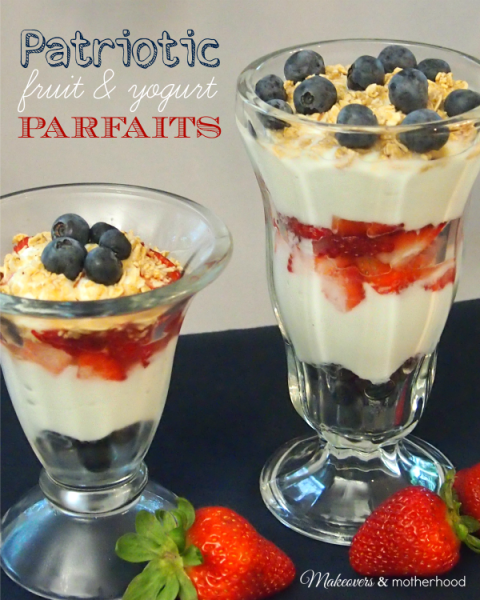 These Patriotic Fruit and Yogurt Parfaits are great for on-the-go! Whether you’re camping, at the lake, driving to work, or out having fun… you can still get your calcium a, whole serving of fruit, and kickstart your morning with this simple breakfast! Happy eating and happy 4th of July!